Probate is the process of proving that a will left by a deceased person is genuine. Probate files are created by the NSW Supreme Court (or equivalent in other States) and transferred gradually to State Records NSW. They are more commonly called ‘probate packets’, since all the documents are folded in three into an envelope. 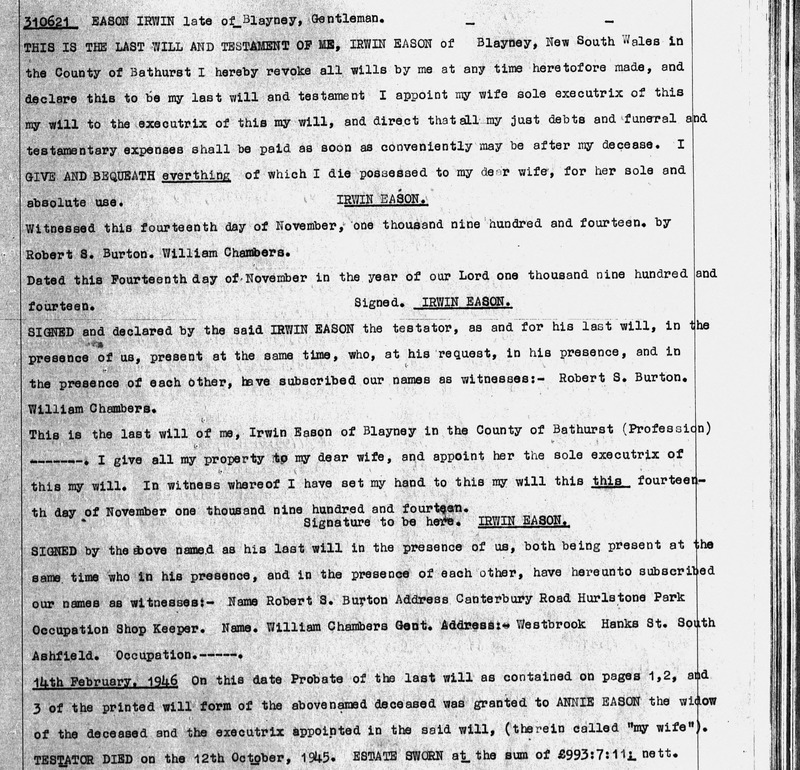 Probate packets can contain all sorts of goodies, including a copy of the will, an inventory of assets, affidavits from family members, and sometimes a copy of the death certificate and newspaper notices. Intestate Estate files can also be found, where the deceased did not leave a will. State Records NSW holds probate packets up to the 1980s, but to find the reference involves searching the index on microfiche created by the NSW Supreme Court. State Records NSW has been gradually adding each packet to it online catalogue, Archives Investigator, so that we can search from home. Now and Then, the State Records NSW newsletter, describes the packets that have been listed so far and how to find them, and I can do no better than to quote the article here (updated September 2014). • The years 1928-1976 from Series 4 – Series 4-152150 to Series 4-828673. Part of 1989 has also been listed. To check if the details of your ancestor’s Probate Packet is now available online just go to Archives Investigator – Simple Search, key in the name of your ancestor followed by the word ‘death’ and click on the ‘Search’ button. If you locate a relevant result you then have the option to order a photocopy of the probate or preorder the probate packet to view in person at the Western Sydney Records Centre (WSRC). A more comprehensive explanation can be found here. Do a search for all your New South Wales ancestors, male and female, and plan a trip out to the Western Sydney Records Centre (WSRC) at Kingswood. Take your digital camera, or use the camera setup they have. Be prepared to pay for photocopies if you can’t deal with the folded up pages. You won’t regret it! Retrieval orders for probate packets are only sent at certain times of the day, so you can save time by pre-ordering up to four packets a day or two before your visit, to be waiting for you when you arrive. You probably already have a copy of your ancestor’s death certificate, which tells you where and how your ancestor died and who was left behind. Probate and deceased estate files can give you much more – what property did he/she have, who was to get what, and who was involved in the distribution process. If there were unusual circumstances surrounding the death an inquest was often held, which will give you details about how they died. This is invaluable information for anyone looking for those details that make up a clearer picture of your ancestor. Probate is the process of deciding who is authorised to administer a will on behalf of the deceased. In the absence of a will letters of administration are issued for the same purpose. A probate packet is all of the documents submitted to the Supreme Court to enable this decision to be made, and can include the original last will and testament and any codicils; asset inventories; affidavits of death, witnesses, and the executor, and sometimes the death certificate and death notices in the local newspaper. The reference numbers for probate packets can be found by checking the Probate Index 1800-1985 on microfiche, which is available in the State Records NSW Reading Rooms and many libraries. 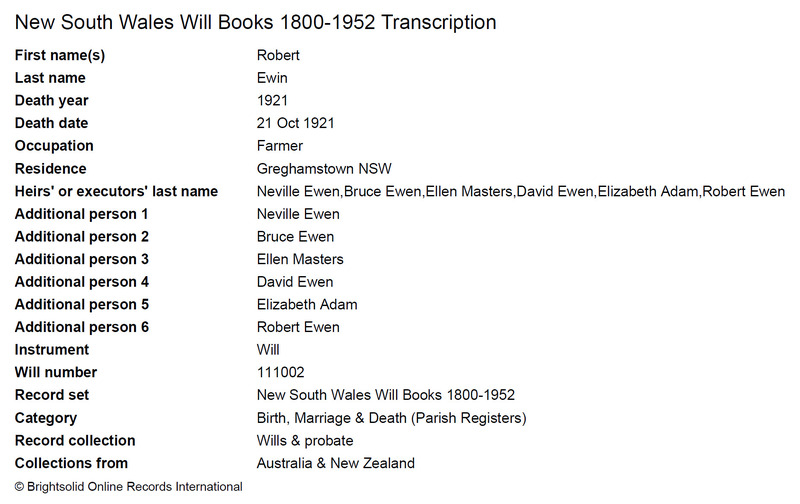 Probate Packets are progressively being indexed in State Records NSW Archives Investigator, which is their “on-line archives information and access system”, and so it’s worth checking here first, especially for deaths in the 1800s. In Archives Investigator use a Simple Search and enter the first name and surname of the deceased, and the word “death”; eg. “John Smith death”, and change the Using to “All Words”. Once you have the reference number (it will give a Series number and a number up to 6 digits long) you can go out to the Western Sydney Records Centre at Kingswood and order the file to look at. Copies can be made. 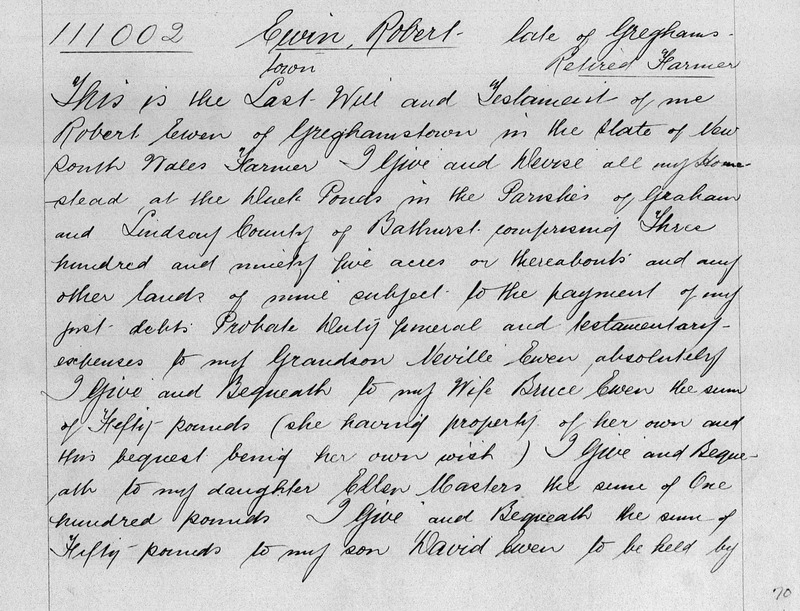 The Supreme Court transcribed wills that had been the subject of probate from 1800 to 1977. These books were handwritten until 1924, and then were typed. The books have been microfilmed up to November 1952 by State Records NSW and are available there. Occasionally the estate was administered by the Public Trustee (previously the Curator of Intestate Estates until 1913). Reasons include missing or non-existent heirs, unwilling executors, delay in administering or applying for probate, or the Curator or Trustee was appointed directly. Case papers after 1913 would be held by the Public Trust Office. Cases prior to 1913 have been transferred to the Western Sydney Records Centre and the index has been microfilmed. An online index is progressively being created by State Records NSW volunteers here. Deceased estate files were created by the Stamp Duties Office. Death duties were payable from 1880 to 1974. An inventory of all assets of the deceased was compiled for the purposes of calculating the death duty payable on the estate. The file can contain wills; inventories of property, farm equipment or business, household furniture, and clothing; property valuations; statements from relatives, valuers and agents; birth, death and marriage certificates; and other documents – depending on the circumstances of the deceased. State Records NSW has an index to deceased estate files on microfiche at both Reading Rooms. An online index is progressively being added to, currently covering the period from 1880 to 1923, giving name, locality, date of death and date duty paid. This last date, the date the duty was paid, determined how the records were filed and so is required to access the file at the Western Sydney Records Centre. Deceased estate files are available for inspection up to 1958. Inquests were held by the Coroner to investigate cause of death. The death certificate should indicate whether an inquest was held. Reasons for conducting an inquest include death by accident, suicide, violence or fire; deaths that took place in public institutions such as hospitals, asylums or police custody; or if the person is unidentified. The inquest may have taken place some time after the death, sometimes years later. Reports of inquests before 1826 can be found on microfilm at State Records NSW Reading Rooms. The Colonial Secretary’s Correspondence sometimes mentions them, and are indexed here. Inquests from 1826 to 1963 are indexed in the Reading Rooms on microfilm, supplemented by a card index at the Western Sydney Records Centre. The inquest files are also available for inspection at the Western Sydney Records Centre. All indexes on microfilm and microfiche are available at State Records NSW Reading Rooms. The records themselves can be examined and photocopies made at the Western Sydney Records Centre at Kingswood in Sydney. Probate packets can be pre-ordered in advance of your visit online here and other files here. Please remember that there may not be a file for the person you are researching, and that the file may be dated many years after the date your ancestor died, so that it cannot be found within the date ranges given. Once you have your copies you will spend many hours examining them and marvelling at the wealth of information they contain, even if your ancestor wasn’t actually wealthy! State Records New South Wales, Archives in Brief Nos. 4, 29, 53, 84. Sydney: State Records Authority of New South Wales, 2004-7. State Records New South Wales, Archives Investigator. Accessed at http://investigator.records.nsw.gov.au/. Sydney: State Records Authority of New South Wales, 2007.